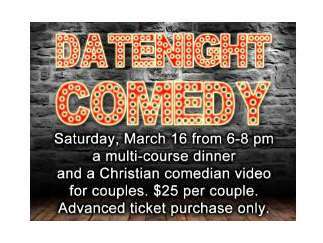 A multi-course dinner and prerecorded Christian comedian Ted Cunningham are included for $25 per couple. Advanced ticket purchase only. To find out more and to get your tickets today visit http://ovchurch.org/date-night-comedy/ For questions or more information please contact Chuck at minister@ovchurch.org or 916-988-2011.